Lots of hand wringing this week as Google launched their new Ad Planner, an online site comparison tool that utilizes data from Google members (pretty much the whole world) to categorize and evaluate Web sites. This comes on the heels of Quantcast’s unveiling of their free Media Planner tool, which offers similar functionality. Until now, meaningful site comparison data was only available from expensive providers like Nielsen and Hitwise. Now, with the release of dual, seemingly competent solutions in a month, what’s the impact on the Internet advertising and media buying space? First, it’s becoming increasingly clear that Google is trying to disintermediate advertising from all sides. They are serving up ads for radio and TV stations. Inserting ads into remnant space for newspapers. And enabling clients to buy it all from the nifty Google interface. I predicted this more than two years ago, and it’s happening. Google wants to do to media buying what the Web did to travel planning, stock purchase and real estate research. Power to the people, and death to the middle man (agencies). The good news, however, is that the availability of free data will dramatically increase interest in online advertising and media planning, the same way that Google Analytics dramatically increased interest in Web site traffic statistics. Did the release of the free Google Analytics kill off the established vendors like Omniture, Webtrends, CoreMetrics et al? Not yet. In fact, it provided a much-needed split in the industry between do-it-yourselfers and serious analytics consultants using enterprise tools. Ad Planner will do the same for online advertising. Small and medium clients and agencies will increase their Internet ad buys due to the comfort of having real data about thousand and thousands of sites. And the big guys will continue using the enterprise solutions. Should we be worried about Google and its long-term desire to take agencies out of the client>agency>media schema? I think the advertising industry is appropriately fearful. But, Google’s (and to a lesser extent Quantcast’s) new media planning tools will help before they hurt. 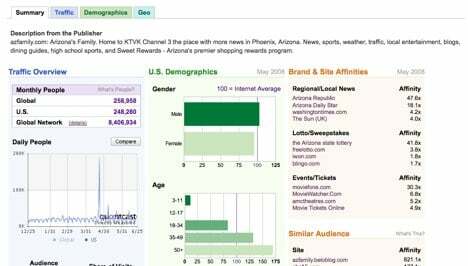 Sample Quantcast Excerpt for azfamily.com a site I founded MANY years ago.